As some of you know, I struggle with weight issues. I struggle with health issues. I struggle, period. I do grow weary of the attitude of “just get to it, do something for yourself.” Trust me, on some days the best thing I do for myself is to get out of bed. I’m not immune to making changes and really do try to move forward each day. I’ve decided that it’s way past the time to fuel my body better. My body has been asking for better nutrition. It’s now receiving better nutrition. And it has responded admirably. My intake of insulin has been cut back drastically in just three days. Plus I’m eating real food, making good choices, being accountable and preparing it myself. Some of you may know I don’t like to cook for myself. It isn’t that I’m unable to cook, I’m pretty good at it. I just don’t enjoy it when it’s only to feed myself. But even I am full of surprises. Last night I looked at what was available in the fridge. There were many good choices. 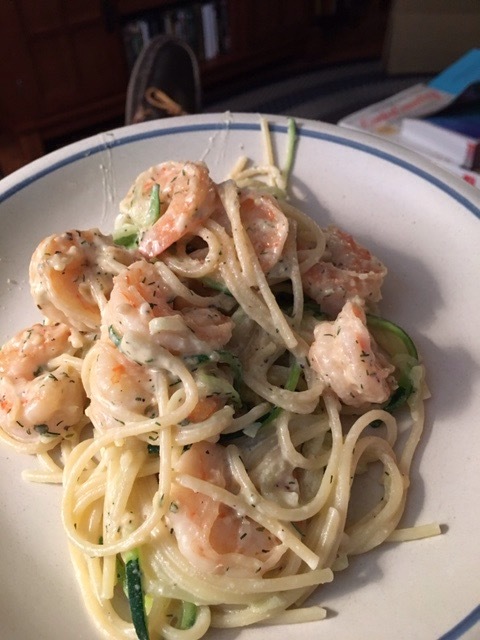 I decided to use some zucchini noodles paired with a small amount of thin spaghetti and shrimp. But I needed a sauce. I have some pesto but felt it was just too much fat since I would probably use more pesto than I should. Having perused some recipe sites I came up with my own idea. I put less than a teaspoon of olive oil in a small skillet and sautéed a little minced garlic. Then I added some non-fat evaporated milk (maybe 2 T) and let that heat. To that I added 2 T of low fat whipped cream cheese and a healthy dollop of dill mix and ground pepper as seasoning. I added the shrimp to the sauce and heated them through. I heated the zoodles and pasta in another skillet, then added the sauce and shrimp and tossed. Voila! A healthy and filling dinner. And NO guilt. I’m learning. I need to learn that small steps are okay and I should find contentment in the little changes. I’m doing things I’ve never done before and learning that these changes aren’t killing me…haha. I will keep praying for the strength to take care of myself because I’m tired of watching the illnesses pile up. This entry was posted in challenges, Change, cooking, Food, mindset, obesity and tagged challenges, cooking, Health, mindset, obesity. Bookmark the permalink.